If you were to select only all-instrumental albums of holiday music, you could hardly do better than the disparate titles here. Composer/conductor Leroy Anderson and guitarist John Fahey come at their seasonal musings from quite different perspectives, but both wind up in a place of joyous reverence for the magnificence and timelessness of Christmas carols and hymns. Anderson, a Harvard-educated student of Walter Piston and George Enescu, became the arranger and orchestrator of the Boston Pops in 1946 and composed some of the quirkiest light orchestral music, well, ever. He tended to be unpredictable when it came to employing the tools of his trade, calling into service, for instance, a typewriter for his 1950 composition, "The Typewriter," which was heard for years, five days a week, on New York City’s classical radio station WQXR-FM as the 10 a.m. theme music for "The Office Hour" show. It does indeed feature a rapidly firing manual typewriter as an intricate component of the melody. His 1954 "Sandpaper Ballet" uses, yes, sandpaper for effect. But it was 1948’s "Sleigh Ride" that put him on the Christmas music map for all time and surely provides the Anderson heirs with a healthy royalty check each year, oft played as the song is once the cold air settles in and the holidays beckon. If ever notes, chords and sound effects (wood blocks emulating the clip-clop of horses' hoofs, and the snap of a whip as the horses gallop along) captured the spirit of a season, and nostalgia for a simpler time when horse-drawn sleighs were common, it is those in the high-spirited, infectious, ever-fresh "Sleigh Ride." 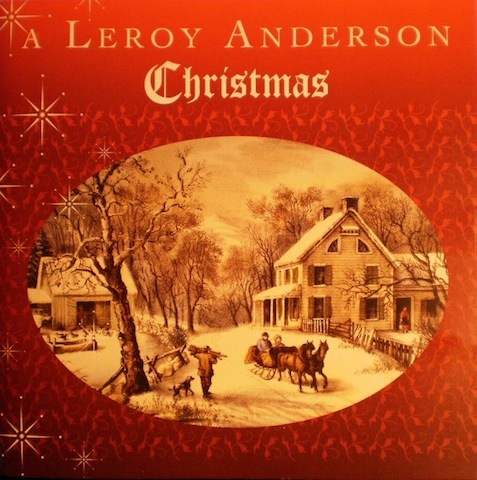 The Arthur Fiedler-conducted Boston Pops' version of "Sleigh Ride" kicks off the wonderful Leroy Anderson Christmas, but the remainder of the disc is solely Anderson and His Orchestra. Following "Sleigh Ride" is a powerful medley of nine sacred-themed Christmas standards titled "A Christmas Festival" (which served as the title of Fiedler and the Pops' wonderful Christmas album from the vinyl era, yet to be reissued on CD), beginning with the resounding, majestic brass introducing "Joy to the World" and thereafter deploying the orchestral textures in their full range of colors in passages both whimsical and lighthearted, soaring and triumphant, weaving together 10 familiar carols. This medley serves as a musical blueprint for what follows: three Suites of carols, one each for Brass Choir, String Orchestra and Woodwind Ensemble. A bold heralding of themes and the purposeful stride of instruments developing the melodies, reminiscent of Anderson's approach in "A Christmas Festival," mark the Brass section. Similarly, the String Orchestra follows the pattern established at the outset of playing alternately in the lively, intimate spirit of a string quartet and the gentle, humming tonalities it brought to the softer orchestral passages of the "Festival." The woodwinds are properly placed as the closing Suite. The many colors of the instruments are interwoven seem to float in an ambiance of rapidly changing tempi and moods. Surely Anderson purposely selected for this section carols expressing the most solemn and spiritual evocations of the holy night, including "Angels In Our Fields" (better known as "Angels We Have Heard On High"), "O Sanctissima," "O Come, O Come Emmanuel" (the oboe solo on which is absolutely haunting in its stark, introspective beauty), "O Come Little Children," the humbling, prayer-like "Coventry Carol" and, to close out the Suite, the exotic, frisky "Patapan." As a reprise, following the Suites, we return to "Sleigh Ride"--and then the ride is complete, so joyous and moving all at once it's a shame it ends. So you hit "Repeat" on your CD player--the record really has that kind of staying power. 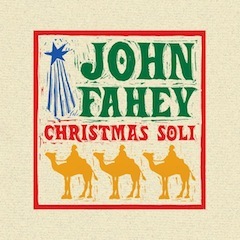 Fahey, playing solo on both The New Possibility and Christmas with John Fahey Vol. II (while also engaging guitarist Richard Ruskin on three duets on Vol. II), achieves grandeur in increments, as the beauty of his arrangements unfolds from cut to cut, his wit and humility both surfacing in equal measure in his unassailable artistic choices. In the quiet, searching inquiry "What Child Is This" (from New Possibility), he enhances the wondrous mood with unusual chordings; a medley of "Hark! The Herald Angels Sing" and "O Come All Ye Faithful" (New Possibility) is given a jolly country feel before the artist makes a seamless transition to a minor mode for a thoughtful reading of the latter tune; playing in an open C tuning and making effective ambient use of glissandos, he wrings all the wistfulness out of a tender version of "Auld Lang Syne"; on "Good King Wenceslas" his deliberate picking, contrasted with a resonant strummed chord and a pause at the end of each verse, conjures the chilly feel of snow laying 'round about, deep and crisp and even. On a fanciful note, it's likely no one's ever played "God Rest Ye Merry Gentlemen" as Fahey offers it here, with pronounced rock 'n' roll drive and a couple of verses punctuated by a chord progression with a distinct '50s feel, specifically lifted from the song "Red Cadillac and A Black Moustache," one of Warren Smith's lesser known but truly inspired Sun recordings (although Fahey's own liner notes say he copped it from a Bob Luman record). In contrast, "Silent Night, Holy Night" is as tender as it could be, Fahey staying true to the melody and picking and chording with quiet dignity, honoring the song's sentiment with no embroidery or musical editorial commentary of his own, save his respect for the tune. With Ruskin in tow on Vol. II, he crafts a richly textured, quite moving interpretation of "Oh Holy Night" by contrasting his heavier sound with Ruskin's feathery, chiming tone (a result of Ruskin having removed all the heavy-gauge strings from his instrument). Like the sturdy blues Fahey offers solo on the black spiritual "Go I Will Send Thee" on The New Possibility, his and Ruskin's dialogue on "Russian Christmas Overture," a Fahey arrangement incorporating quotes from secular classical compositions by Rimsky-Korsakov and Prokofiev, this song enlarges the palette of seasonal fare by finding poetry hidden from others' ears; Fahey and Ruskin split the lead parts, and clearly take delight in baffling listeners with what will come next--a taste of minor-key Russian melodrama here, a frisky, fleet-fingered country blues riff there and a breathtaking restating of the establishing theme at the most unexpected moments, as a kind of link between the brusque Russian and folksy American backwoods segments. It's a beautiful dialogue, and the only song on the disc that doesn't want to end--it fades out instead. Side two of the vinyl version of Vol. II contained an ambitious original composition in two parts, titled "Christmas Fantasy." Alas, in transferring both albums to CD, Rhino ran out of space on the disc, and only Part II of the "Christmas Fantasy" is here. It's a sprawling work, with some original passages, atonal segments, impressionistic fingerpicking passages, and snippets of Christmas carols popping up throughout. The feel of the whole piece is meditative, Fahey exploring not only the tones and dynamics of his guitar but the moods of the Yuletide season. It closes the album on a reflective note, even if it is only part of a larger, more complex meditation that makes more demands of a listener than just about any modern Christmas composition extant but delivers a reward of equal spiritual value. These are not the only Christmas albums Fahey recorded. For the Varrick label he cut Christmas Guitar Volume One (in 1982, essentially a re-recording of The New Possibility) and, a year later, Popular Songs of Christmas & New Year’s, a duet album with guitarist Terry Robb. In 1994 Burnside Distribution issued the interesting John Fahey Christmas Album, which featured the guitarist accompanied by strings and woodwinds—that is, cello (Brenda Pleasance), piano (Joe Heinemann); flute (Kate Finn)—and subtle sound effects (Greg Fisher). 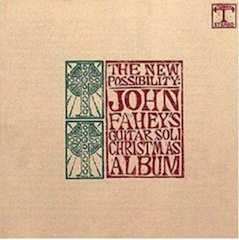 In a new 14-track CD titled The New Possibility: John Fahey’s Guitar Soli Christmas Album, Fantasy has compiled tracks from the Varrick albums into a solid if incomplete overview of the artist’s Christmas-themed music. The first eight tracks are from the two albums reviewed above (including three of the stirring duets with Richard Raskin); three are from the revisited New Possibility of 1982, including a straightforward “The First Noel”; a blues-inflected “It Came Upon a Midnight Clear” full of bent notes and near-palpable melancholy, absent any of the wonder and awe common in most vocal versions, notably the towering, sublime rendition by Frank Sinatra from 1957’s A Jolly Christmas from Frank Sinatra (in stark contrast to his pleasant but shallower interpretation on his first run at the song in 1948 for his Christmas Songs by Sinatra 78 RPM album set on Columbia); and a far more unsettled treatment of “Silent Night, Holy Night,” replete with weird, swooping slide cries and a rolling ostinato figure at the end that together form something akin to a mocking chorus. With Terry Robb on Popular Songs of Christmas & New Year’s Fahey crafts a straight-ahead take on “Santa Claus is Coming to Town,” save for its final 20 seconds when he slows it down to a near-dirge tempo. The duo also get together on a medley of “Deck the Hall with Boughs of Holly” and “We Wish You a Merry Christmas” that pretty much colors within the lines with some effective, and affecting, unison work on the latter tune; and finally the guitarists complete their understated triptych here with a truly tender, respectful treatment of “The Christmas Song,” much as Mel Tormé and Robert Wells intended it. All in all this new disc is fine as a Fahey Christmas sampler, but there’s much more happening in terms of text and subtext on the albums from which it draws its program—and of course, one entire album is not represented at all. So, Leroy Anderson and John Fahey--strange bedfellows it might seem, but sharing common ground as American celebrants of the Christmas season. Neither artist speaks or sings a word on these discs, but what comes through their instruments--an orchestra, in Anderson's case; guitars, in Fahey's--tells us all we need to know about their respect for the mystery and the meaning of the defining event of the season and their innate understanding of its many complexities. Noel!